Alternative search terms: Split pea soup slow cooker recipe, vegetarian pea soup recipe, slow cooker pea soup, pea soup recipe, best split pea soup, home-made pea soup, how to make pea soup, vegan split pea soup, cream of pea soup, green pea soup, wholefood recipe. This spicy and creamy pea soup is full of protein, is filling, and can be made very cheaply either with frozen green peas or dried green peas. It is vegan, sugar-free, dairy-free, gluten-free and easy to digest, so you will not get tired after eating it. This recipe is for a slow cooker (crockpot) because this method will save time, but the soup can also be cooked in a pot on the stove. The secret to making a good soup is to cook it on low temperature, for a long time, and adding some form of fat into it - in this case I added cacao butter. Of course the chilli and other spices, as well as the creaminess of coconut milk play an important role in the flavour of this recipe. The green pea soup is ideal for lunch because it is filling and will provide lasting energy. Green Pea Soup, Step 2: All the ingredients in the crockpot, ready for cooking. Wash all the ingredients thoroughly and peel and dice as necessary. Keep the chilli pepper whole. Add all the ingredients to the crockpot (slow cooker). Cook on 'high' setting for three hours. Remove the red chilli pepper and cardamom pods, and puree the rest of the soup using a potato masher. 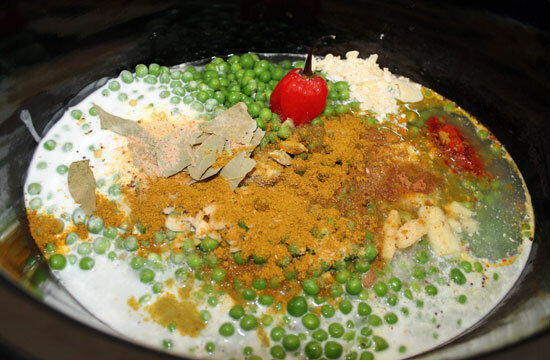 You may choose to leave 1/4 of the soup unmashed and mix it with the pureed soup for a more interesting look and texture. Serve with slices of lemon, fresh peas, and a drizzle of olive oil on top. Alternatively, you could garnish with fresh herbs, spinach, cayenne pepper, or anything your heart desires! Just before serving, add salt, black pepper, and cut off pieces of the red chilli to taste. Just swishing the cooked chilli around the soup a little bit will add spiciness too. Ready! 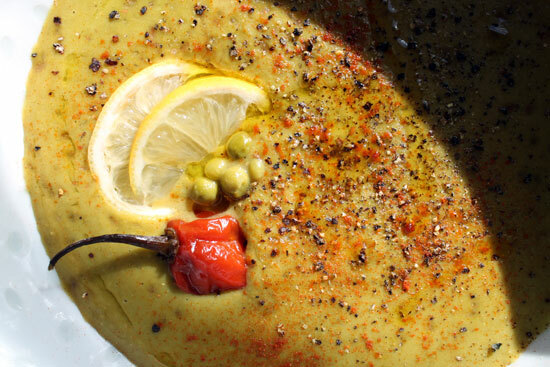 You can now enjoy your creamy, spicy pea soup. If you don't have a slow cooker (crockpot), consider in investing in one. You can get one very cheaply, and although the cheaper ones come without a timer, you can purchase one from an electrical store, which will cut the electricity off the crockpot at a set time. You can then make the soup at breakfast time and enjoy it for lunch, or set it to cook so it's ready for when you return from work. Slow cooker saves a lot of time as you don't have to stand over the soup while it is cooking. As always, make a bigger portion at once and freeze some of the soup for future, so when you need to eat quickly, you will always have food available. You could mix in some fresh herbs or vegetables in the soup just before serving, to have a raw food ingredient. For example: pieces of sweetcorn, fresh cilantro (coriander), or cherry tomato halves can work well. Some people add ham or other meat to green pea soup as well. Other mild-tasting vegetables can easily be added to the soup as well, such as spinach, spring onion, leeks, more potatoes, etc. This split pea soup crockpot recipe was inspired by various different Thai pea soups, as well as the Finnish traditional pea soup, 'Hernekeitto', which is a lot less spicy.